(Excerpts from a survey undertaken from December 20, 1979 to January 5, 1980, in Colombia and Ecuador and from Report submitted to the Intergovernmental Oceanographic Commission and to the International Coordination Group for the Tsunami Warning System in the Pacific(ICG/ITSU). A major earthquake measuring 7.9 on the Richter scale occurred at 07:59:4.3 (UT) on 12 December 1979 along the Pacific Coast of Colombia. The 12 December 1979 earthquake and tsunami associated with it, were responsible for the destruction of at least six fishing villages and the death of hundreds of people in the State of Narino in Colombia. The earthquake was felt in Bogota, Cali, Popayan, Buenaventura and other major cities and villages in Colombia, and in Guayaquil, Esmeraldas, Quito and other parts of Ecuador. An investigation of the effects of the earthquake and tsunami was undertaken by ITIC. Tumaco and San Juan Island -- two of the areas that were most affected by the earthquake and tsunami were visited and surveyed. Because of the inaccessibility of the area destroyed by the earthquake and tsunami, all of the coastal villages were not visited. However, reports of earthquake and tsunami effects, as well as casualty and damage figures, were compiled from Civil Defense records and eyewitness accounts. The following is an account of the ITIC investigation. The earthquake measured 7.9 on the Richter scale (MS) and occurred at 07:59:4.3 (UT) on 12 December 1979. The epicenter of the earthquake was in the ocean at 1.584° North Latitude and 79.386° West Longitude. The origin time, magnitude and epicenter location have been reported by the U.S. National Earthquake Service (NEIS) in the preliminary report (PDE #50-79, 9 Jan 1980) and are based on the averages reported from 171 seismic stations around the world. The standard deviation in epicenter determination of the 12 December event given by NEIS is 1.1 seconds which translated into distance it means that the epicenter could be within a circle of approximately 8 nautical miles, as given in Figure 1. This epicenter is a refinement of the preliminary epicenter which had been given as 2.4 North and 79.0 West, immediately following the event. The refined epicenter is considerably further to the south and to the west than that given earlier and it is nearer the Colombian-Ecuadorian border. It is a little difficult to explain the earthquake effects in the State of Narino, Colombia and the absence of considerable damage in Esmeraldas, and other cities and villages of Ecuador which were fairly close to the revised epicenter. One would have to examine carefully the structural geology of the area to determine why the earthquake had far more severe effects in Colombia than it had in Ecuador. For example, the presence of an offshore ridge was determined by the preliminary examination of a small scale bathymetric chart of the area. This ridge is in the vicinity of the epicenter has an orientation in a northwest southeast direction. The ridge may be in fact part of an extensive fault line along which many historical earthquakes may have occurred. Other underwater ridges exist offshore from Tumaco, indicating a complex system of geological structures in the area. In the absence of comprehensive geological information for the area it is not possible to speculate on the source mechanism of the earthquake at this time. However, an attempt is made to partly explain the characteristics of the tsunami generating area on the basis of scant field evidence and observations made during the ITIC survey. 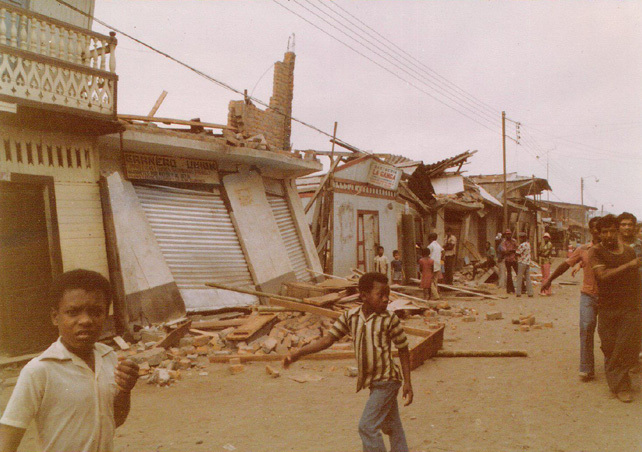 The earthquake of 12 December 1979 centered in the State of Narino in the southwest corner of Colombia, bordered to the south by Ecuador and to the west by the Pacific Ocean. The shock was felt over a wide area ranging from Bogota to the north to Quito and Guayaquil to the South. The quake had three major shock waves which according to reports lasted from 2:59 AM until 3:04 AM, local time (0759 to 0804 UT). This `was the strongest earthquake in that part of Colombia since 19 January 1958 when an event of 7.8 in magnitude occurred. It was the second large earthquake to occur in Colombia within a month. 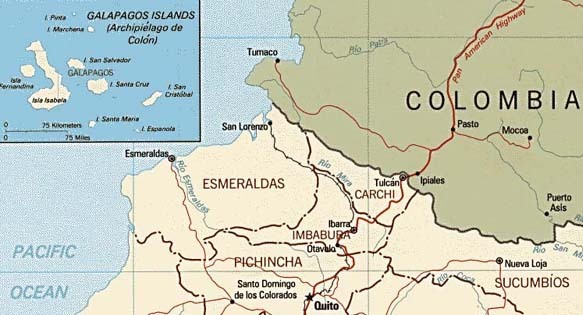 An earthquake of magnitude 6.7 on the Richter scale occurred further north of the State of Narino in Colombia on 23 November 1979, killing 44 persons, injuring hundreds and causing extensive damage. According to the Geophysical Institute of Javeriana University, there were at least 10 major aftershocks lasting for several days following the major event of 12 December. The violent quake left numerous dead and injured and destroyed thousands of buildings principally in the State of Narino, Colombia. In Bogota and other major cities in Colombia, tall buildings swayed, but damage was not significant. The shock was felt throughout Ecuador and caused some damage in villages and towns near the Colombian border, but no casualties were reported from that country. The State of Narino is one of the least developed areas of Colombia, and there is lack of roads and runways making it one of the most inaccessible areas of the country. Most of the inhabitants live in villages and towns on the coast or near waterways, as the area is mostly jungle. Preliminary reports estimated the number of persons killed in the hundreds with up to 2,000 people missing. The area was declared a disaster area, and Army, Navy, and Civil Defense officials began rescue and supply operations quickly after the disaster struck. Electrical power and telephone lines were knocked out in several areas of the State of Narino, but were quickly restored a few days later. At the time of the ITIC survey in the last week of December 1979, there was still lack of potable water in the area. Hardest hit by the earthquake and the tsunami was Charco, a Colombian fishing village of 4,000 persons -- about 300 kilometers north of the Ecuadorian border, where 100% of all the houses were either seriously damaged or totally destroyed. Most of the houses at Charco were built on stilts over a lake. It is not known at this time whether the houses were destroyed by the earthquake or by wave action. Numerous deaths and injuries were reported from this area. Most of the victims were women and children. Hundreds of people at Charco had to sleep on the ground following the disaster, and had to go without food and drinking water for several days. The landing strip at Charco was inundated, becoming unusable for relief operations. Most of the supplies had to be flown to the airport in Guapi, about 30 kilometers from Charco. The second populated area that was hardest hit by the earthquake was the seaport of Tumaco, only about 80 kilometers from the earthquake epicenter. At least 40 persons were killed and 750 injured by the earthquake, which destroyed approximately 10% of the houses and other buildings in the town of 80,000. Included in the buildings that were destroyed was the four-story Las Americas Hotel. Tumaco is built on an island made up of alluvial deposits of Rio Mira and Rio Caunapi. In fact the whole area appears to have formed from deltaic deposits. 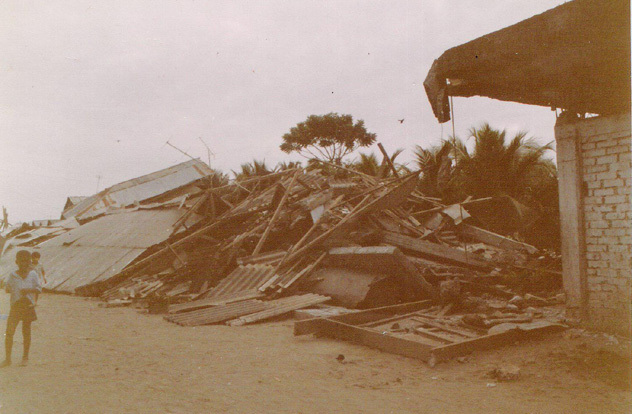 Evidence of liquefaction was evident in many areas of the city of Tumaco where structures failed and it was particularly evident along sections of the waterfront. Evidence of subsidence was found on either side of the bridge connecting the island where Tumaco is situated to the island where the airport is located. It appeared that the island dropped by as much as 60 centimeters. Evidence of subsidence of about 60 centimeters also was reported from the island of Rompido, offshore from Tumaco, and a good portion of that island was under water. Subsidence of approximately 50 centimeters was reported from Cascaja1 Island. Other fishing villages in the State of Narino that were destroyed were Curval, Timiti, San Juan, Mulatos and Iscuande. Most of the damage and deaths in these villages, however, were the result of the tsunami. 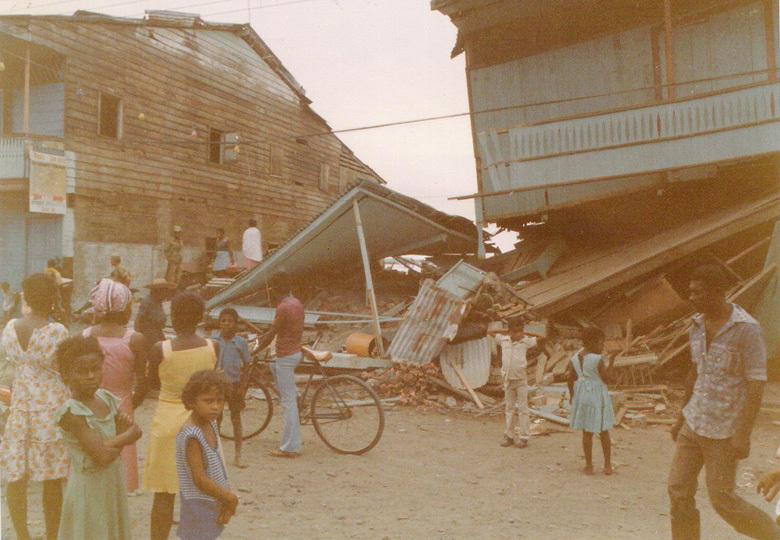 The 12 December 1979 earthquake resulted in a tsunami that practically wiped out six of the coastal fishing villages along Colombia's southwest Pacific coast and left hundreds of persons dead or missing. At least 15 other coastal towns in the area were rocked by the earthquake and were damaged by the waves. Waves measuring anywhere from 2-5 meters destroyed many of these coastal villages. People along the coast, who survived the earthquake by running outside their homes were carried away a few minutes later by the large tsunami waves generated by the earthquake. Six fishing boats, one with 40 men aboard, were lost. A pier on the prison island of Gorgona was destroyed, however, no injuries from either the earthquake or the tsunami were reported from there. 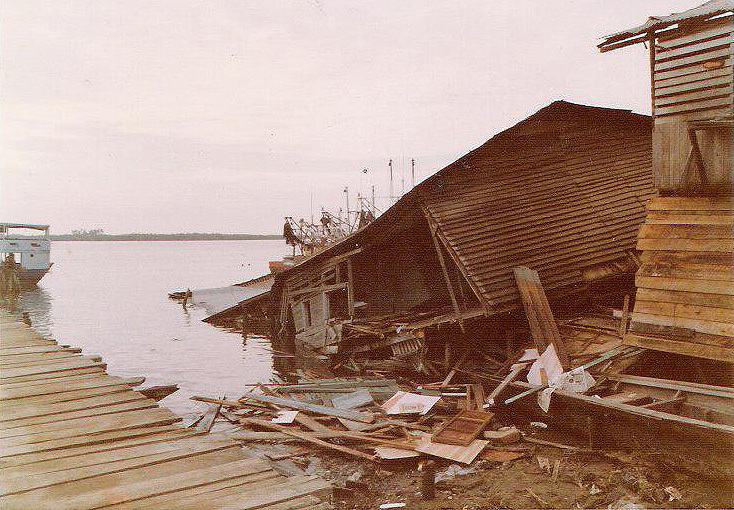 Most of the houses at Charco, a village of 4,000, which were built on stilts over a lake were knocked into the water. Waves sent the Iscuande River out of its banks along the Pacific coast. The wall of water reportedly in the village of Iscuande caused extensive damages. At least one person was reported dead from that area. Hardest hit of all the coastal villages was the fishing village of San Juan, where the waves completely overran the island destroying just about everything in their path. Numerous deaths were reported from San Juan which was totally devastated and is in the process of being relocated further inland at the present time. According to eyewitness reports, 3 to 4 waves were observed, the first wave arriving approximately 10 minutes after the main earthquake. The water recessed first to about 3 meters below the level of the sea. The first wave arrived minutes later. The third wave was the largest, and at San Juan Island it was approximately 5 meters above the level of the tide, which fortunately, was at its lowest at that time. The maximum difference between low and high tide in the region for that time of the year was approximately 1.3 meters, thus, the maximum wave could have been that much more, if it had arrived at high tide, and numerous more deaths could have resulted. Considering that the mean elevation of the coastal islands is approximately 2 - 2 1/2 meters above high tide, it would mean that maximum waves would have completely overrun all of the coastal islands in the area. Approximately 30-35 kilometers of the coast were hardest hit by the tsunami, while the length of the area hardest hit by the earthquake was approximately 225 kilometers in length, from Guapi to Tumaco. Table 1 was compiled from Civil Defense records, and gives casualties and damages from the combined effects of the earthquake and tsunami. These government figures in actuality are underestimates. The earthquake and tsunami may have resulted in numerous more deaths than those given in the official estimates, since the census figures for the area are at least ten years old, and since final tabulation had not been made at the time of the ITIC survey. It is estimated also that the majority of casualties (at least 807) were the result of the tsunami rather than of the earthquake. Because of the inaccuracy of the census figures, it may be difficult, even in the future, to determine the number of people that lost their lives. It is also difficult to separate the deaths caused by the earthquake from those that were caused by the tsunami. An ITIC estimate based on informal reports is that 500-600 people may have been killed by the combined effects of the earthquake and tsunami with about 4,000 people injured. 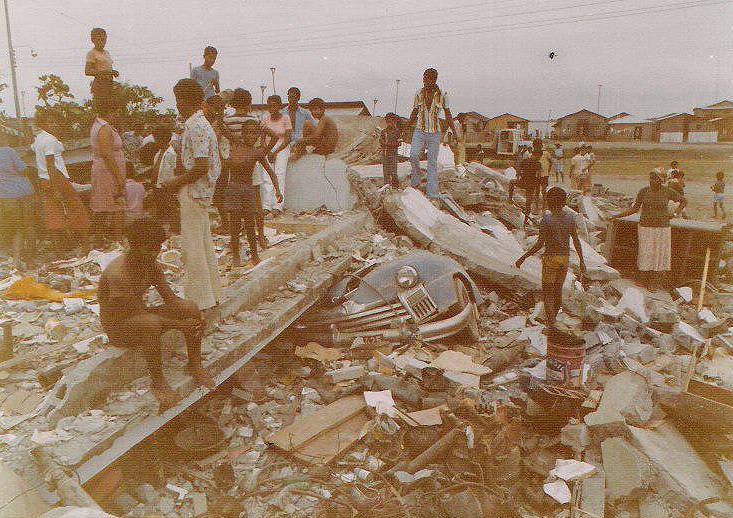 Homes of at least 10,000 persons were destroyed. Final and more accurate estimates will be provided at a later time. 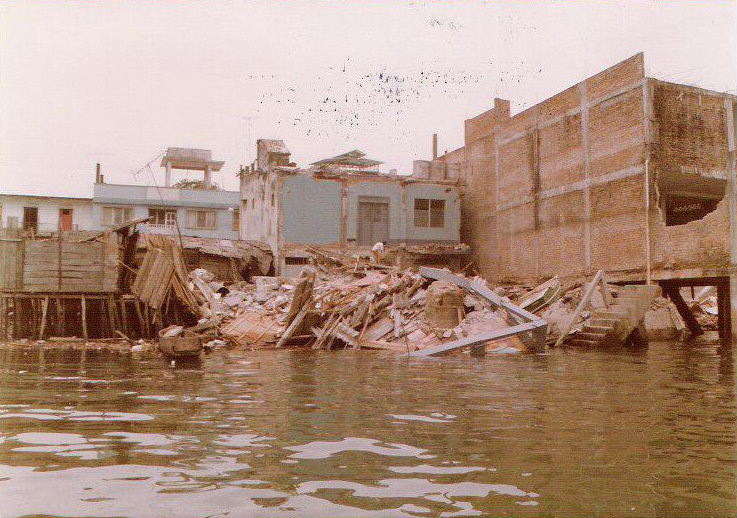 The Tsunami of 12 December 1979 earthquake as recorded in Esmeraldas, Ecuador. This tsunami record was obtained from the port of Esmeraldas in Ecuador, approximately 95 nautical miles to the south of the epicenter. It is confirmed from this record that the tsunami occurred at the lowest possible tide, that the first wave activity was a recession followed by approximately 3 to 4 waves. No tsunami damage occurred in Tumaco (Colombia) or Esmeraldas (Ecuador), but had the wave occurred at high tide, it is believed that flooding and considerable tsunami damage would have occurred at these two cities. For example, if the wave had occurred at high tide, its elevation would have been 1-3 meters higher than the 1 meter wave observed in Tumaco, and could have resulted in extensive tsunami damage of that city. Preliminary assessment of the tsunami generating area indicates that the orientation of the generating area was an ellipse with the major axis being in a northern direction (Figure 1). However, this is preliminary and will be refined when more mareographic data is collected. Because of the orientation of the generating area, it appears that coastal areas to the south and to the north of the generating area were not affected greatly by the tsunami. Minimum tsunami energy was propagated to the north or to the south of the generating area explaining, for example, why Tumaco experienced relatively small tsunami waves although so close to the generating area. At San Juan Island, where maximum waves were observed, the direction of approach of the waves was from the southwest, rather than from the west. The direction of wave approach was obtained by observing fallen palm trees, detritus material wrapped around objects and the way buildings had moved or structurally failed. When he mareographic records from Buenaventura and Tumaco become available, it will be easier to reconstruct the generating area of the tsunami. Based on the record obtained from Esmeraldas, it appears that the travel time to that tide station was only 5-6 minutes after the quake. The tsunami generated in Colombia was also observed in many places of the Pacific including the Hawaiian Islands. It took a little over 12 hours to reach Hawaii. At Hilo and at Kahului, maximum wave observed (trough to crest) was approximately 40 centimeters. At Nawiliwili the wave was only 10 cm. At Johnston Island the wave was only 8 cm. A deep water gauge off the coast near Tokyo, Japan did not record any wave activity. Figure 3 is a computer-generated tsunami refraction diagram and travel time chart for the 12 December 1979 tsunami across the Pacific Ocean (Steve Poole, Personal Communication).